Jean E. Zachary, 53, of Galloway was arrested by Ofc. Pat Neal for DWI on July 14. Marc A. Kaufman, 56 and Mary Kaufman, 55 both of Hillside were arrested by Ofc. Przemyslaw Ryba for assault and improper behavior on July 14. Jamey Mendick, 23 and Kelly A. Connor, 22, both of Galloway were arrested by Ofc. Przemyslaw Ryba for assault and improper behavior on July 14. Savanna Ingham, 22, of Gallowaywas arrested by Ofc. Christian Magazzu for falsely incriminating another on July 14. Donald Gardner, 39, of Egg Harbor Twp. was arrested by Ofc. Jacqueline Crocker for hindering apprehension on July 15. Michael A. Leone, 25, of Galloway was arrested by Ofc. Matt Worth for DWI on July 15. Nimeshkum D. Patel, 38, of Galloway was arrested by Det. Ryan Goehringer for assault on July 15. Jason R. Valentine, 44, of Hamilton Twp. was arrested by Sgt. Mark D’Esposito for hindering apprehension on July 16. Thomas E. Ranieri, 54, of Brigantine was arrested by Ofc. Scott Winneberger for possession of less than 50 grams of marijuana and DWI on July 17. Jerry T. Williams, 25, of Atlantic City was arrested by Ofc. Bob Bauer for receiving stolen property and hindering apprehension on July 18. Tyrell Tolbert, 28, of Atlantic City was arrested by Ofc. Scott Winneberger for hindering apprehension on July 18. Jeffery Martin, 23, of Atlantic City was arrested by Ofc. Scott Winneberger for hindering apprehension on July 18. John Kelly III, 44, of Somers Point was arrested by Ofc. Przemyslaw Ryba for hindering apprehension on July 19. 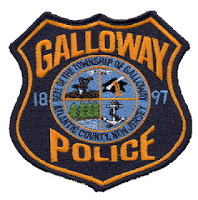 Thomas Mandra Jr., 52, of Galloway was arrested by Ofc. Przemyslaw Ryba for DWI on July 20. Joseph A. McCullen, 56, of Mullica Twp. was arrested by Ofc. Jacqueline Crocker for DWI and criminal mischief on July 20. Dorian Dixon, 24, of Egg Harbor, was arrested by Det. Ryan Goehringer for possession of less than 50 grams of marijuana and possession of drug paraphernalia on July 20.